It may be defined as a cream product containing air bubbles captured in a network of fat globules. Cream containing more than 30% fat can be converted into whipping cream by beating it with air to nearly double the volume of cream. Beating cream produces foam by incorporating air in the cream. The foam thus produced has remarkable stability. If whipping is continued it yields butter because of the joining of the fat globules together. 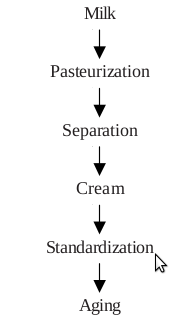 Homogenization of high fat whipping cream produces excessively viscous product and hence not desired. It also decreases the functional property of whipping cream. Homogenization, however, is used for the production of spoon-able whipped cream and in UHT pasteurized whipping cream to prevent fat separation. ii) Composition of fat i.e. proportion of crystalline fat and liquid fat. More crystalline fat is preferred. iii) Combination of cream-protein: It is needed in the composition to help formation of air cells. iv) Surface-active substances: Addition of surface-active substances like mono-glyceride or Tween helps. v) Temperature of cream: Higher temperature lowers the whipping quality. vi) Separation temperature of cream. vii) Ageing: Ageing at 4°C is desirable to produce more crystalline fat in cream. viii) Acidity of cream: If the acidity of cream is higher it reduces whipping quality. ix) Addition of stabilizers: It reduces whipping ability. Cream obtained from pasteurized milk is standardized to contain 35-36% fat. The standardized cream is stored for 24 hours at 4°C so that all the fat globules contain some crystalline fat. A thickening agent like k-carrageenan @ 0.01% is added to cream to prevent creaming or serum separation during storage. The aged cream is then pasteurized preferably by holder method at a temperature of 74°C for 30 min. In-can sterilization of whipping cream is not advisable as it causes coalescence of fat globules unless it is homogenized. But homogenization impairs the whipping ability of cream. UHT heating of cream homogenized at low pressure (e.g. 2 and 0.7 M Pa at 35°C) and containing some emulsifiers is preferred. However, fluctuation of temperature during UHT treatment may increase the viscosity, decrease whipping properties and cause churning. The pasteurized and cooled cream is stored in cold store to effect crystallization of liquid fat. Whipping i.e. beating of cream with air is done prior to use of whipped cream. Whipping produces stable foam by enclosing air bubbles in network of fat.Slow beating of cream may cause churning of cream while vigorous beating results in high over-run and finally smooth foam. Prolonged whipping may also cause churning and yield butter and butter milk. Whipping effect can also be produced in aerosol can without clumping of fat globules and beating. The foam is formed when the gas pressure in cans is released. The foam thus produced is unstable. Therefore,it requires addition of some surfactants or presence of proteins to impart some degree of stability by protein. 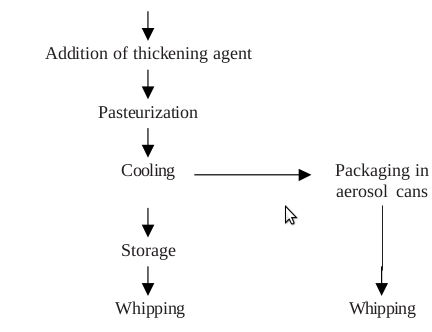 The process of preparation of whipping cream involves the steps outlined in Fig. Copyright © . Dairy Technology .